2001… it feels like just yesterday, it feels like a lifetime ago. I had just purchased a new home, and wanted to do something totally immersive and over-the-top with one of the rooms. I wasn’t sure what, exactly… just something unexpected, just one room as a total escape from the world. After settling on Hawaiian for a theme, and digging into my decorating options, I stumbled into this vast and rich history of Tiki bars and Polynesian restaurants. And then came… well, this blog, and this site, and this other site, the bulk of my social life, and practically my whole existence. The soundscape of my little basement getaway was one of my early design targets, and one of my very first Tiki purchases was Swanky’s Swank Vinyl Exotica I CD. As the title declares, it is a collection of tracks culled from Swanky’s vinyl collection. It’s a little rough around the edges, owing to the non-pristine state of your typical old exotica LP and the limitations of Swanky’s equipment at the time. But it was a great addition to my small-but-growing cache of Tiki must-haves back then. Swanky no longer sells copies of his Swank Vinyl Exotica I (or its sister, II). But! He’s now making both albums available for download. For free! Right now! Some of the tracks are old standbys you’ve heard before, some of them are oddball recordings not available for purchase. 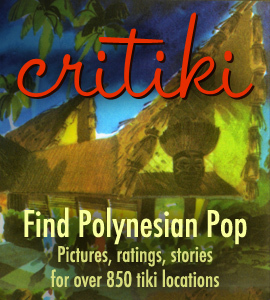 Next Next post: Stuck at Home for Tiki Oasis?